osedax n a species of deep sea worm that feasts only on the bones of dead whales. Follow us on Facebook and Instagram or favorite us on Etsy to stay updated on our projects! 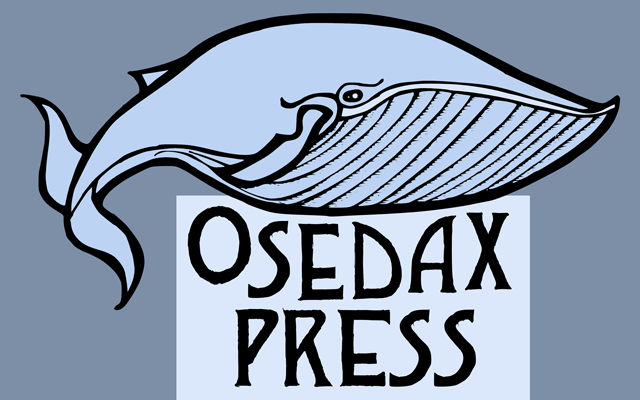 Osedax Press was founded in 2014 and is based in Lexington, Ky. We delight in the poetic, strange, and uncountable, and specialize in small limited-run publications such as zines, chapbooks, and broadsides. Our name is taken from a species of deep sea worm which feasts only on the bones of dead whales; “osedax” means bone-eating. The idea of bone-eating is central to our press: we believe that it’s valuable and vital to re-purpose and re-invent what has come before. Our primary project, Scrimshander Books, a series of literary pamphlets dealing with topics such as heartbreak, nutrition, death, and wallflowery, takes the titles of its volumes from the titles of E. Haldeman-Julius’s Little Blue Books of the 1920s. Each volume contains a careful selection of poetry and prose that engages with a given theme; the result is a blend of literary journal and instructional booklet which seeks to inspire, upset, amuse, and seek out new truths via any means necessary. Our other projects include EXACTLY LIKE LOVE, a collection of poetry by Alan Walowitz, and DIVINATIONS, a poetic project from Christopher McCurry. More information is available on the “Our Projects and Where to Find Them” page.